If you're at all serious about learning to play the guitar, you'll already know the secret to advancing your skills. Saying it is actually easier said than done. 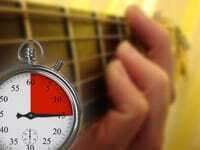 You need to, first of all, make the time, and you also need to come up with a suitable practice routine, that will develop your guitar skills. 1/3 devoted to technical aspects of playing guitar and scales. This gets you practicing and refining things you have already learned. 1/3 devoted to learning new stuff. This is where you advance as a guitarist/musician. Each part of this general practice routine is important, but it is still just that, pretty general. This is where an awesome website that I just found comes into play, MusicDiscipline.com. The website is basically an online practice session generator, that will randomly give you exercises to practice. Because of the type of exercises, I can assume the site is aimed at intermediate guitarists, so not total beginners. Make sure you're in tune, and begin! The site will randomly generate several practice exercises for you, each with a timer, so you don't run out of your allotted practice time. Each practice exercise will be between 5-10 minutes long, depending on the complexity. Once the time runs out for a given exercise, you can continue to the next one. If I counted correctly, there are presently 179 exercise sets the website will thrown at you. This is made up of variations of given subjects, so for example, there are 15 variations of exercises for learning the minor pentatonic scale. A lot of the exercises involve practicing a given lick or technique, which is made more efficient with the online metronome that's embedded at the bottom of each exercise page. If you create a free account, the system tracks what you've practiced, so it doesn't give you the same exercise twice. I didn't test this though, but it sounds like a smart feature. I would maybe modify it a bit, so that it doesn't give you the same exercise for let's say 5 sessions, after which it's OK to repeat. Have a look at MusicDiscipline.com if you're feeling out of ideas on how to fill your practice time, it's a very useful and fun way of filling your session. Hello Mr, thanks you for providing this useful website! I will try it during my studies of guitar playing when I have time. I think this will make my guitar practicing time better. hey man, I’m johnny, the author of music discipline. thanks for this blog post, hopefully it will help the website reach more visitors. It’s true that the site is currently aimed for intermediate guitarists (those playing for about a year or more at least), but exercises for beginners are in the works, and so are exercises for the bass guitar. keep up the good work with the blog!